Hopelessness is often the first reaction when we consider our mounting existential crisis. We feel it in our gut, in our mind, in our soul, whenever we consider the plight of our ecology, our economy, our consciousness, our relationships, our hope, our children, our future. We easily forget that there are many sources of wisdom from our ancestral spiritual traditions that can help us through this tremendous and unprecedented period of personal and global uncertainty. This wisdom of the sages who have come before us and who are still with us cannot be destroyed. This wisdom is far more powerful than any exploitation, injustice, and pollution we can create in the falsity of our egos. It is this wisdom which we must turn to now in order to make a place for all living beings in our present and in our future. Mahabharata: The Eternal Quest by award-winning storyteller Andy Fraenkel (Sankirtana Dasa) is one apropos example of this essential wisdom. The Mahabharata is considered one of the oldest and of the greatest epics of antiquity. Composed more than 5,000 years ago by the great Vedic sage Vyasa, the Mahabharata tells the story of what is both a heart-rendingly personal and catastrophically collective battle that threatens the very structure and fabric of civilization. Composed of more than 100,000 shlokas, or verses, totally nearly 2 million words, it is eight times longer that the Iliad and Odyssey combined. It is a tale of a civil war between two sides of a familial dynasty vying for control of the global empire of Bharata, commencing in the Battle of Kurukestra, which in its technicolor splendor of ultra-violence, retribution, revenge, and redemption makes Napoleon's greatest dogfights look like small-fry indie films. 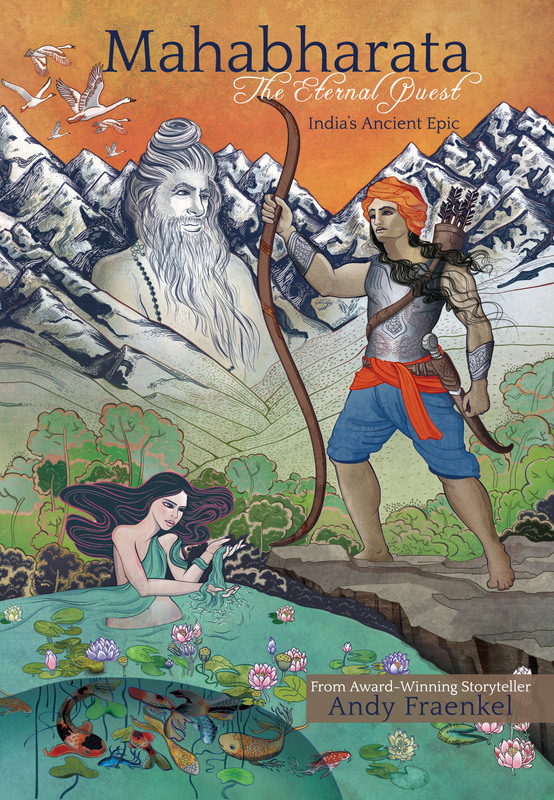 Within the sturm-und-drang of this epic and timeless drama, the sage Vyasa presents the foundational teachings of the dharma of the Vedic/Hindu tradition. One of the fundamental sources of dharma within the Mahabharata is the great classic of Eastern wisdom, the Bhagavad-Gita. The Gita is the dialogue between Krishna, the Divine Person and the charioteer of the great Pandava warrior Arjuna, who faces his own existential doubts preceding the Battle of Kuruksetra. Arjuna is facing the prospect of having to fight and likely kill many of his most beloved family members and teachers. In this moment of exceptional crisis Krishna reveals to Arjuna and to us the essential wisdom of dharma which can repair the torn fabric of identity, community, and civilization. Mahabharata is the first of books. The Dharma teachings, the responsibilities of leadership, and warnings of the impending Kali-yuga (our age of darkness) are described as the five thousand year old epic unfolds. It's a book that belongs to all the peoples of the world. The intent of my rendition is threefold: to deliver the story as good literature, to give it a cinematic slant, as potentially the basis for a film, and to keep it at a length that could easily be studied in college classrooms. Fraenkel comes from a long tradition of interpretors of the essential wisdom of the Mahabharata. Having won several awards and fellowships for his storytelling skills, and having spoken and performed at the Parliament of the World's Religions and the National Storytelling Conference, Fraenkel brings a grasp of both the theatrical (being a veteran actor, Fraenkel developed and performed in a two-man Mahabharata drama staged off-Broadway) and the numinous (having been a practitioner of the Hindu/Vaisnava tradition for many decades, of which the Mahabharata is an essential wisdom source). "the dharma is the essence of all sacred teachings. When we understand the dharma we can live a life of wellness. That means we live in a balance of both the spiritual and the material. In this way, both the individual and society as a whole prospers. But that delicate balance is lost when everyone feels it's OK to just give into run-away desires to secure material wealth and pleasure at all costs. And that's why our society seems to be unraveling now. We have lost sight of the dharma. Understanding the dharma is pivotal to what Mahabharata: The Eternal Quest is all about." The eminence and relevancy of the Mahabharata comes from its Lord of the Rings-like sense of epic emotion and intrigue combined with its most profound and practically applicable spiritual erudition for their time, for our time, and for all time. Being so immersed himself in the depth of the drama and the drama of the depth of the Mahabharata, Fraenkel expertly provides a rendition which can not only entertain and edify us, but also point in essential directions going forward for our fragile civilization. For more on Mahabharata: The Eternal Quest, including info on how to order the book, check out The Mahabharata Project.